Caution: Caveman Cooking and Broil King are proud to announce the Summer Grilling Review & Receive Series! 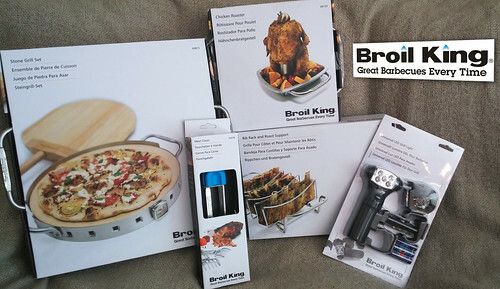 For the next five weeks, each Monday (starting this coming Monday 8/3/2015) we will review one of Broil King’s fine collection of grilling accessories. On Friday of each week during the series, one lucky person will win their own sample of that week’s accessory! I know what you’re saying. “Cave! How did this come to be? And, how do I win?” The answer to the first question is that the fine folks at Broil King liked our review of their Baron 440 Grill so much, they asked if we would be willing to review some of their BBQ accouterment. Of course, we were raring to go. But, we thought some of you might like to try them out, too. The BK clan thought that it was an excellent idea. So, to gain an entry to each week’s giveaway, you’ll have to read the review here on the C3 blog and comment with the words “I WANT ONE” by 11:59:59PM PDT on the Thursday of the week the item is reviewed. Want additional entries? It’s simple! Gain an additional entry when you “Like” Caution: Caveman Cooking on Facebook, and another each when you follow us on Twitter and Instagram. You’ll also gain another entry when you “Like” Broil King on Facebook, and another each when you follow them on Twitter and Instagram. Plus, one more entry by “Sharing” our Facebook link to that week’s review. Of course, if you already like or follow us on those sites you will automatically receive those entries … just let us know your names on those sites in your comment. That’s 8 total entries up for grabs to give you a a better shot of winning. Be sure to read the contest rules. No Purchase or payment of any kind is necessary to enter or win. A purchase will not improve your chances of winning. You have not yet won. Odds of winning are dependent on number of entries. The sponsors of the sweepstakes are the Caution: Caveman Cooking (C3) website and Broil King© aka ©Onward Manufacturing Company Ltd. (BK) (collectively, the “Sponsors”). Entries for this contest are only accepted online. To enter, visit http://cavemancooking.net and reply to each week’s post reviewing (one review per week for five  consecutive weeks) one of BK’s grilling accessories with the words “I Want One” to receive one “Original Entry” into the grand prize drawing. Additional “Bonus Entries” may be obtained as follows: An additional single (1) entry by following Caution: Caveman Cooking on Twitter, and another single (1) entry by following Broil King on Twitter (must have a valid Twitter account to follow and receive these entries). An additional single (1) entry for following Caution: Caveman Cooking on Instagram, and another single (1) entry by following Broil King on Instagram (must have a valid Instagram account to follow and receive these entries). An additional single (1) entry for giving a “Like” to the Caution: Caveman Cooking page on Facebook, and another single (1) entry by giving a “Like” to the Broil King page on Facebook (must have a valid Facebook account to “Like” and receive these entries). And, an additional single (1) entry for “Sharing” Caution: Caveman Cooking’s Facebook link to that week’s review (must have a valid Facebook account to “Share” and receive this entry). A valid WordPress account, or other WordPress accepted form of login, is required for all entries. You must also provide a valid e-mail address as part of your WordPress sign-in for account verification and all contest-related communications. “Bonus Entries” may only be obtained if the “Original Entry” has been properly completed. There is a maximum of seven (8) entries per entrant, per contest (one “Original Entry”, seven “Bonus Entries”). You must list in your comment/reply all bonus entries you are seeking to qualify for in order for them to be valid for the drawing. Online entries will be deemed to have been submitted by the C3 visitor at time of the entry. Entrant must put all entry methods into ONE single comment/reply … multiple comments/replies will not be accepted!. If multiple comments/replies are submitted, only the first comment/reply will be accepted for entry into the drawing. The C3 staff will randomly draw the winning entries after the submission period ends. The selection of the winning entries are at the sole discretion of the C3 staff and may change at any time up until an official announcement of the winner is made. When the winner is notified by e-mail, the winner must reply with all contact information requested within three (3) days from the date the notification e-mail was sent, or another winner may be selected. Winner must sign and return an Affidavit of Eligibility and Release of Liability within 3 days of receipt. In the event of noncompliance within 3 days, an alternate winner may be selected. Winner selection is under the supervision of Sponsors, whose decisions are final. Only one (1) winner will be selected for each prize available: Week 1 – Q-Lite, Week 2 – Pork Claws, Week 3 – Rib & Week Roast Rack, 4 – Chicken Roaster With Pan, and Week 5 – Pizza Stone Grill Kit. Once an entrant is chosen for a prize they are immediately ineligible for any other prizes offered in this contest. Only one (1) prize per winner. Only residents of the 50 United States, District of Columbia, and Canada who are 18 years of age or older are eligible. Employees of Sponsors and members of their immediate families & household members are not eligible. Sweepstakes subject to all federal, state and local laws and is void wherever prohibited by law. Any prize or prize notification returned to Sponsors as undeliverable may result in the awarding of the prize to an alternate winner, which will be the next entrant selected. By acceptance of prize, winner allows use of their name, photograph or other likeness, testimonial and other biographical information for any and all purposes, including, but not limited to, advertising, trade and/or promotion on behalf of Sponsors, without further compensation, unless prohibited by law. Submission of entry constitutes permission for Sponsors to use entrant’s submitted information and photo for marketing and promotion purposes, without any compensation, subject to Sponsors’ privacy policies unless prohibited by law. Winners are solely responsible for any applicable federal, state, or local taxes due as a result of their participation in this contest. No fee to enter. You have not yet won. You may not enter on this page – you must go to each actual review post in the Summer Grilling Review & Receive series on Caution: Caveman Cooking to enter. Prizes are not transferable or redeemable for cash. Taxes on prizes are winners’ responsibility. Sponsors may substitute a prize of equal or greater value due to unavailability. The entry deadline for this promotion is 11:59:59 PM PDT on the Thursday of the week each review is published. Void where prohibited. ©2015 Caution: Caveman Cooking/UHearMe, Inc. All rights reserved. This originally appeared on the Caution: Caveman Cooking blog at http://cavemancooking.net.